January can be a no man's land when it comes to shopping. Most of us are burnt out from holiday excesses, watching our budgets, or scouring slim pickings. I fall in the latter category: After the flu left me house-bound for a week and a half, I was finally able to shop—only to find there wasn't much worth buying. But, a couple weeks have passed and more markdowns have hit my favourite sites' sale sections, which means there are definitely gems to be found. 1. J. Crew Factory classic button-down shirt in dotted chambray ($45.50). 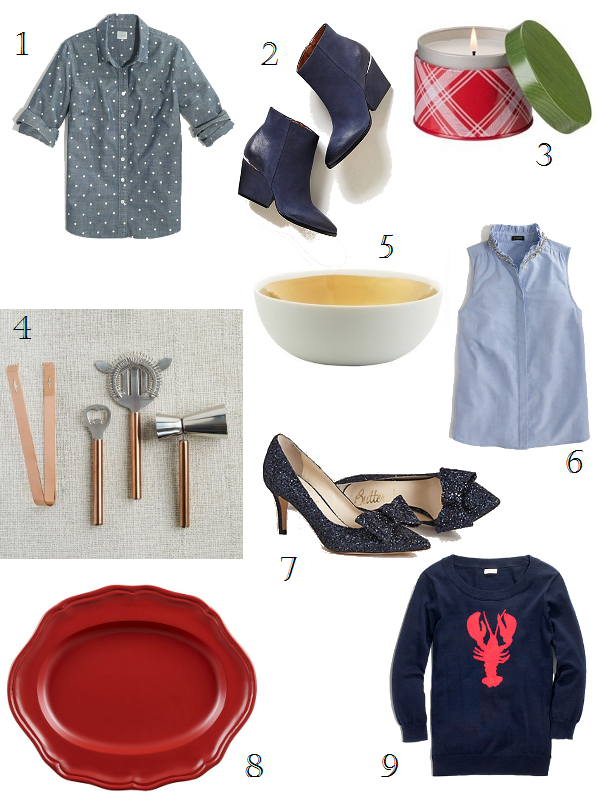 Chambray shirts are undoubtedly a wardrobe staple; this one gets a dose of whimsy via polka dots. 3. Frasier Fir tin candle ($9.50 at Chapters Indigo). I know, I know, Christmas is over, but I still can't help burning these evergreen-scented candles. They provide just the right wintry ambiance while getting rid of the smell of last night's dinner. Plus, they're half off! I'm stocking up for this winter and next. 4. West Elm Market copper bar tools ($5.70-8.02). These accessories would elevate any bar cart. 5. Dauville gold glazed bowl ($12 at Chapters Indigo). Fill one of these gold-and-white bowls with lemons or avocados and set them on your kitchen counter, or use the smaller version to organize trinkets and dainty jewelry. 6. J. Crew Factory jewel-collar oxford shell ($61.50). Swap in one of these the next time you're tempted to wear your standard cardigan-tee-jeans combo. The jeweled collar and crisp oxford style will dress up even the most casual look. 7. Devote pumps. Okay, the second school of thought on buying sale shoes believes that, since you're paying a reduced price, you should get the crazy, "I'd never buy those full price" shoes you secretly dream of. I'm guessing a lot of people subscribe to this school, because these sparkly, bow-bedecked babies sold out while I was writing this post. 8. CB2 portrait red platter ($17.97). Oversize serving platters always come in handy at dinner parties and potlucks, and after the holidays, one can usually find good deals on them. 9. J. Crew Factory lobster intarsia sweater ($68.50). My love of intarsia knits is well-documented on this blog, so of course I couldn't resist this one. It reminds me of the Tibi lobster sweater I coveted ages ago. Plus, the navy colour, 3/4 sleeves, and cotton fabrication make this a versatile layering piece.